Is there any way to get the xml files out of a .faction file created by the faction editor so they can be put back in as a mod? I don't want to create a huge mod, I just want to create a faction which is more different than the built-in faction designer will let me. It was done so that that custom race creators wouldn't need to restart the game when they have finished. So it might be possible in the future to have it exported to XML. Well, at least that's a reasonable, technical reason, as opposed to some cockamamie anti-cheating reason, though it would've been nice if it did, as he said, create an .xml of the custom file. Hopefully they'll get onto that at some point, or someone will figure out how to convert the binary file out into an .xml. I'm trying to make a race that has more faction points than the built-in editor will let me start with, but I'm having the devil's own time. Ah well, more than one way to do something. CheatEngine and modding the faction directly don't seem to be working, but someone on Steam tipped me off to the values where the race creator points are stored. Where do a put a picture into the game so that it can be selected when using the race editor? I want to put background pics as well as portraits. Some examples are Star Trek characters, Battlestar Galactica, B5, Personal pics of friends and family etc. Not a programmer so I'm trying to avoid messing with .XML files hence why I want to use in game editor as much as possible. Also sort of related how do I attach ship designs to a race. For example if I create the Federation as a race, can I create a bunch of Federation Ships in the Ship Designer and attach them to this race so that no matter if this race is played by the AI or play only these ships will show? Look in the folders you see there. Here is the way it looks at race setup! The start screen before you go to your planet. The Diplomacy screen The race icon is over his head not over his face. TheLegoCruiser sorry it took me so long I was very sick for over a week and I`m still not all the way over it. I`ll send you a PM. Hi guys im new here and i want to learn about modding.. But my first questiion here is how we can add more racial points/ability points?? Is there a database of available mods available somewhere out there? Not as yet - that'll come with the steam integration I expect. 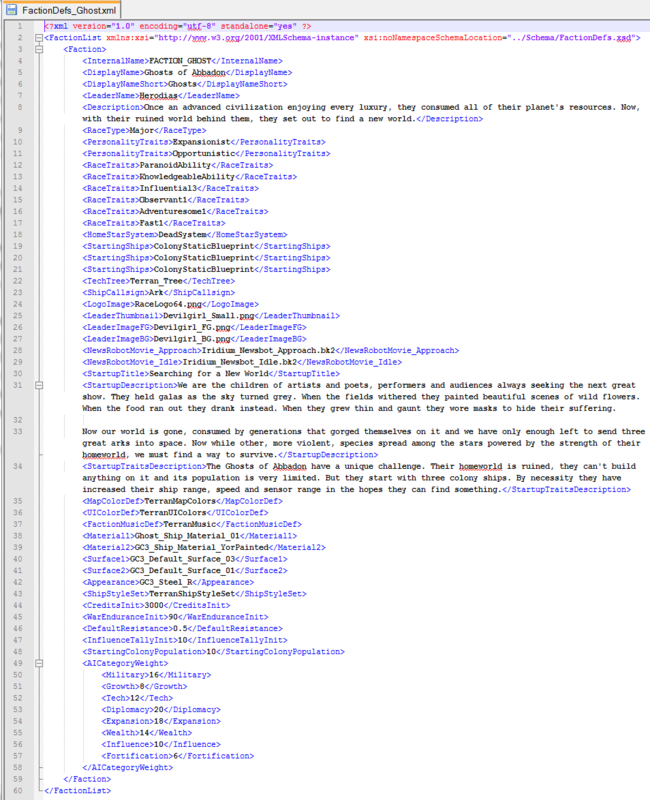 Then I copied the folders from the example mod into this (game, core etc. ), and put some copied game files into those folders and modified certain values. What I don't understand is how GCIII determines what mod it should use? In GC II you had to point the game to a specifc mod folder, but here in GC III it just seems to be "enable mods" in the game's options? If you got several mods how does the game know which one I want to play with? Is there something else I need to do to activate a specific mod? When there's a conflict (i.e., multiple mods with the same files in), it just uses the last one that gets loaded into memory. It's pretty hard to guess which one. Hey, I've run into a problem with my custom race. Namely, ideology. 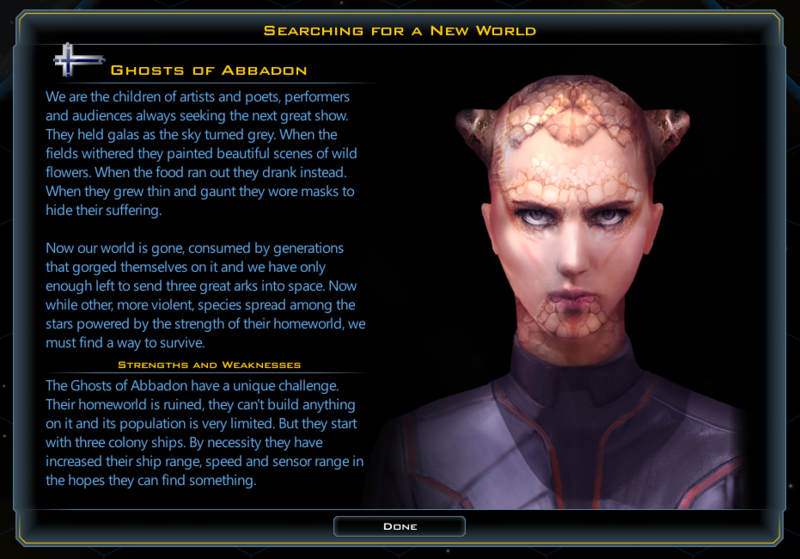 I'm trying to set it to be a Benevolent race, but even I placed the personality trait, "Benevolent" in the xml, the game keeps reading its ideology as pragmatic. Anyone know how I can fix this? So far I've modded in several factions both major and minor with only a few issues, typically me misspelling or forgetting to put something. However, I can't find the issue with my most recent two mods, the Confederacy of Independent Systems and the l'Cie Sanctum. Every time I try to use them as the player race or and AI race the game shuts down as the map tries to load. The problem seems to be the home system, because if I copy either race in the ingame editor and change the home system they work fine. But when I compare the StarDefs, PlanetDefs, and StarSystemDefs to my other mods and the originals btu I cant find the issue. There is no setting. .faction files cannot be edited by anything but GC3 itself. 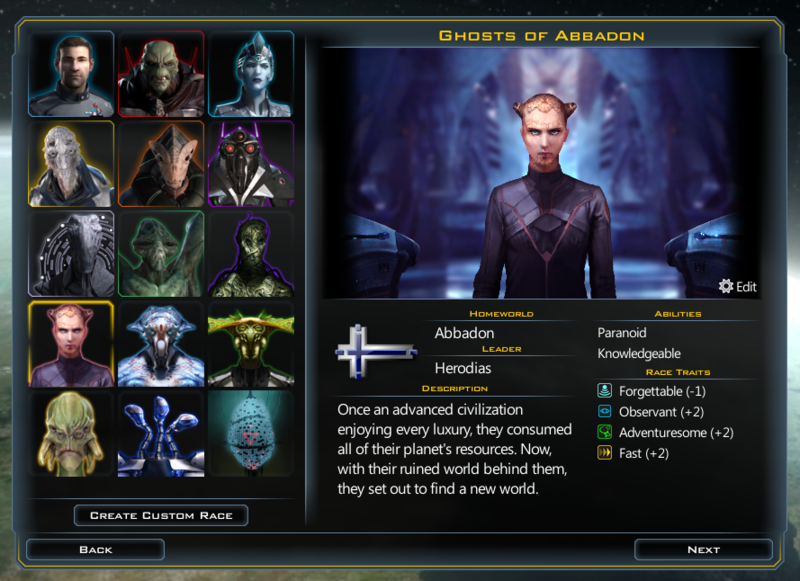 Potentially dumb question, but was the Ghosts of Abbadon faction mod that Derek Paxton made in the OP ever actually released? Kinda like to play with them in one of my games. specifically i noticed there is a <StrategicResource> for planetdefs.xml which i have figured out to either be true or false, yet i can not see the effect so i assume it has to do with planet type. 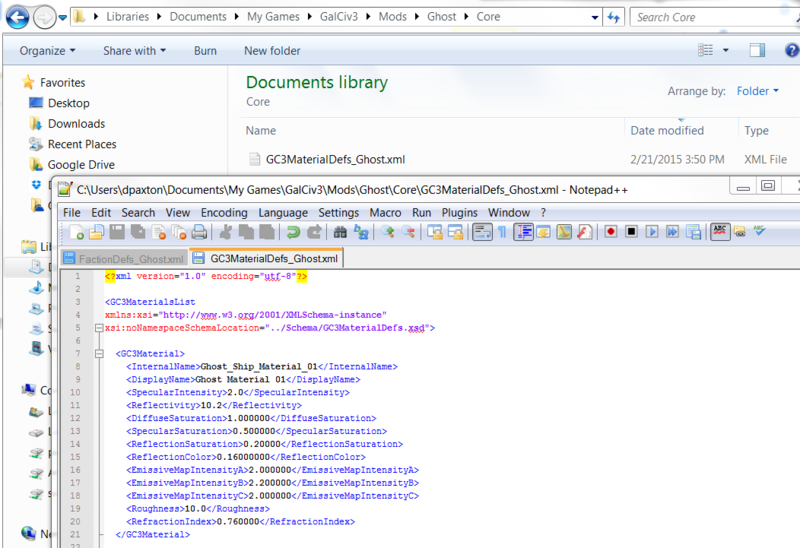 You can see what is available by looking that the Schema file associated with the xml you are editing. You may need(most likely will) to check the "include" Schema files too. 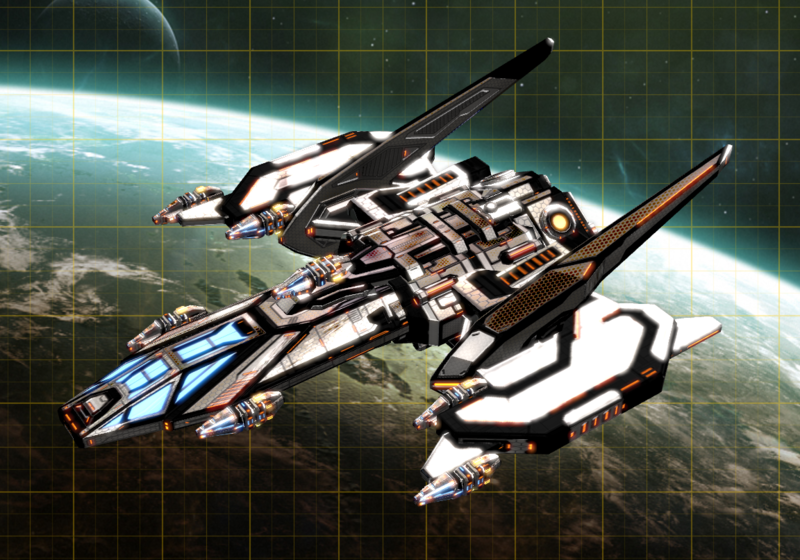 You do know that with Crusade and the DLCs it`s actually quite easy now to make a babylon5 mod yourself? It would only take time and referring to the series for accuracy. I haven`t made one, but the intro soundtrack of my game is from the later series of Babylon5 intro. Very fitting. After posting a post about wanting to add more planets in my faction system. I would like to have 5 planets that are Habitable. How do I write it up or can it be done?